This wall mounted phone shelf not only keeps phone books handy but the extra storage provides plenty of room for pens, pencils and letters. 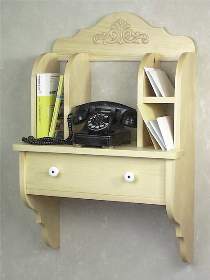 Designed to accommodate all wall mounted or table top style phones. Plans drawn FULL SIZE. Project measures 35"H x 22"W x 11"D. Order Hardware separately below.